With just over 12 weeks to go until the festival opens their doors, this year's Truck Festival is set to be the biggest ever with the Platinum selling George Ezra, cult heroes Courteeners and indie-comeback-kings Friendly Fires. It's not just all about the music however as the festival provides a lot more entertainment suitable for all ages. They've just announced their new and improved Family & Kids area which offers jam-packed entertainment across the weekend from Thursday through to Sunday for kids of all ages. 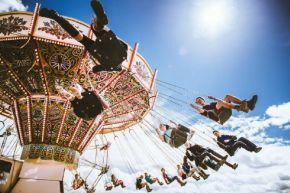 To ensure the 21st year of Truck Festival is their best yet one yet, this year they're teaming up with Elissa Gold Events to present their new and improved 'The Village Green' The family friendly area will be packed to the rafters with activities throughout the weekend. Including Circus Skills, Egg & Spoon Races, Water Balloon Fights, Campfire Story-Telling, Craft School, Disco and even all-ages Morning Yoga. Set inside a beautiful bell tent there will be the Babychange space, which offers and safe and secluded environment for parents to nurse and change their babies and this year will also see a visit from the Truck Library: The Library will house a cosy chill-out space filled with bean bags, throws and cushions. Books will be available for children of all ages and all in tune with key stages set by the National Curriculum. Family Camping tickets are on sale now and don’t forget 12 and Under's go free! In addition to the offerings from Elissa Gold Events, Truck has also this year teamed up with Dorest Cereals who will be providing free breakfast cereals each morning for all family campers and be set up on arrival to offer a helping hand with luggage. Dorset Cereals will be offering to lend a helping hand to unload tents and camping equipment from festival entrance car to campsite, all free of charge on arrival!